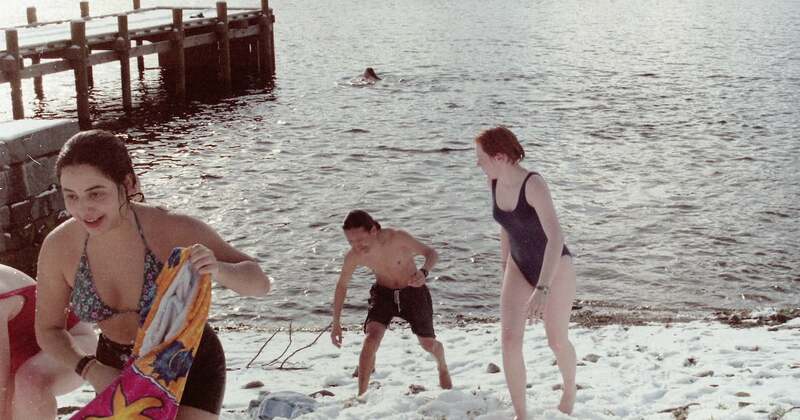 During my time at Red Cross Nordic UWC in Norway, I did many things for the first time — such as taking a dip in the Fjord (see above image), making and camping out in snow caves in the winter, cross-country skiing, winter hiking and camping on cross-country skiis etc. I also made a life decision — I decided on a career. When I did, I sent out the following letter to a few referees detailing my plans. I am writing to inform you of my future goals and aspirations in the hope that it will help you write a fair reference on my behalf. I am looking at some five American Universities for a place in their Education School. Enclosed please find an envelope for a reference to each university. Please enclose the letter in the appropriate envelope, seal and sign outside, and mail all of them directly to me so that I can include them in my application packages. Deadlines for application vary — starting from early January to end of March. As, however, I would like to send my material off as early as possible for financial aid consideration purposes, I would appreciate your sending them to me at your earliest convenience. Enclosed please also find a copy of my resume for your records. And lastly, I would also appreciate an acknowledgment of the receipt of this letter and the documents herein, via e-mail would be fine. While teaching, I would also be looking at getting a Master of Education degree as I hope to return to Nepal and start a school for the people of Mustang district, where my family comes from. The last couple of years of teaching experiences at UWC’s and the current experience here at the Nordic UWC has pretty much sealed my decision to make a career out of education. Considering my background, I have had some extraordinary opportunities, not least of which has been education. As one very much committed to the ideals of the UWC’s, I intend to lay, for the next generation of youngsters from my village and the surrounding areas, the foundation for the kind of educational opportunities I had: I hope to return to Nepal and open a school in either Pokhara, where the majority of the people from my village live, or Jomsom, the political and economic headquarters of Mustang district. I believe a short introduction on Mustang would help here. Mustang, an area inhabited by Tibeto-burman (i.e. ethnic Tibetan) people practicing a mix of Tibetan Buddhism and Bon religion, is a remote and, until recently, highly restricted area, and as such has remained underdeveloped and, socially and economically, very far behind many other areas of Nepal. My parents and their generation, when growing up, had no educational opportunities. I myself visited my village for the first time in almost twenty years in July 1995. Despite having spent the first few years of my life in our village of Tangbe, once my family moved to Pokhara, I never went back. In July 1995 I found the area pretty much as Michel found it three decades ago. It was as I remembered it to be two decades ago and just as my parents and relatives had told me — nothing like any other place I had seen in my travels. I visited the area this past summer as well and hope to return as often as possible. The most significant change in the area has been the migration of people from those villages to the cities, mostly to Pokhara. Except for a very few families living in Kathmandu and the few (totaling about hundred people) still living in the village, all the people from my village, for example, live in Pokhara. Many of them have been living in Pokhara for more than a decade and have managed to establish themselves relatively well through sheer hard work and perseverance. However, amongst the new generation of Mustang people, few have managed to obtain any kind of formal education and better their lot. I have been incredibly fortunate. Of about three dozen or so first cousins in my extended family, a few of them older than myself, none had finished high school until I did. Two more have, so far, and are attending college. Needless to say, a college degree was unheard of until I got mine. Some never had the opportunity. Most dropped out for one reason or another, and only the remaining few are still in school. And, realistically speaking, if even one of them gets a college degree, that would be a major accomplishment. Gone are the days of my parents and their generation when formal education was just a luxury and not absolutely essential. If the next generation of Tibeto-burman people from Mustang are to succeed, education is the way to go. And I want to be one of those that makes a significant contribution to that. I didn’t go to the US for my teaching qualification in spite of getting offers from a number of schools I had applied to, including Teachers College, Columbia University in New York City. I didn’t get the financial assistance I sought. I ended up going to University of New South Wales in Sydney, Australia instead! Your story inspires me. One day I hope to meet you and talk about my future plans which are similar to yours. Glad to hear it! Would love to chat about your future plans. I am assuming you are NOT in Nepal. (If you are, that can be easily arranged.) Look me up when you come to Nepal!